Fiddlers envelopes with 10 tickets were handed out to all members. Please sell them. Scott Johnson seeks vocational speakers to talk for 5 minutes for a program on Sept. 10. Thanks to Julie Joy Stilwell for agreeing to manage Rotary awards this year. Jody Dolan Holehouse gave a foundation report about the Club Foundation meeting outcomes. They decided to allocate the funds on hand as of June 30 for this year’s projects. Then we will raise money this year to allocate in the coming year. This way we start “salting away” money for future vision. Rotary District 5240 District Conference is September 28-30 on the Queen Mary in Long Beach. Register on the District website. Lunch lottery. Past pairs: Chris Tucker and Ken Beisser. Tara Stoker and Richard Redmond. Rendezvous was at Brewhouse last week and will be at the Brewhouse again this week on Thursday night at 5:30. Remember: The Brewhouse is a supporter of the Fiddlers’ Festival. Last year they donated all the beer! Today is Michael Jackson’s birthday. Yesterday was world sauntering day, and President David Velarde demonstrated sauntering. Tomorrow is National Toasted Marshmallow Day. Steve Boehm won the raffle. 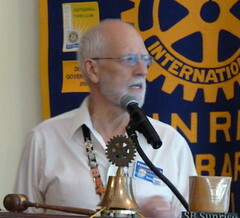 Jeff Boehm, member since April 2012. 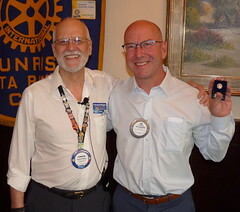 He is a third generation Rotarian. His grandfather and his father (Steve Boehm) are members. Jeff plans to split time between SB and a city in Mexico that the scribe does not know how to spell. 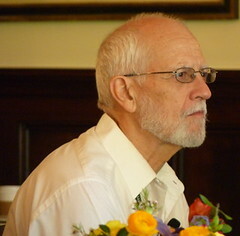 Bill Wilmer, his mentor, encouraged Jeff to meet Luz Maria Ortiz-Smith. He came to a meeting and really enjoyed it — especially the send off to Bill Wilmer. He got goosebumps and joined. His family’s vocations are primarily publishing and metal fabrication. Travel has been a big part of his life. He went to India in 2009 when his cousin invited him to go to Molki, India, to a surfing ashram. He took to the philosophy and spirituality. It’s what took him to Mexico, where they are starting a mission. Then his cousin suggested they return to India to try out e-learning platforms there at vocational training centers. They presented in Mumbai. His cousin left three days later, so he returned to the ashram and visited other ones, too. In Mexico, they’re starting a health and wellness center with a cafe. They’re encouraging people to develop their passions at the mission. Graduated UCSB San Diego in 2007. Working on SB Community Builders project. The Boehm Group is publishing a book featuring about 40 businesses, which will be distributed for free — 10,000 copies. His fiancé is Ashley Doubleday. She’s a full-time nanny for twins in Montecito. She’s up for adventure. Bill Ringer, member since 2002. Grew up in Boise, Idaho. He went to his 50th high school reunion. Checked into ROTC program and started volunteeting for everything he could to stay out of a swamp in Vietnam, including volunteering to go to grad school. 1967 went to flight school and learned to fly helicopters. “I certainly wouldn’t have done all the things I did without the army.” He was really grateful for what the army did for him. It gave him direction. Went to war in 1968 and joined assault helicopter team. In total, 22 years of military service. He bought into a fixed base in northern Idaho. Was 49% owner until they sold it. Then it was on to U.S. Forest Service flying, helicopter skiers, helicopter logging. In 1979, he met his wife Vicki, who was also working for the Forest Service. He knew that falling in love with her would interfere with plans for big game hunting, backpacking, etc … but he fell in love with her anyway. He bought a corvette, which you can’t drive in winter in Colorado. Bill accepted a job in Singapore. Vicki said ok, after some resistance, and then they had to be married so that she could join him there. They lived and travelled throughout Asia: Manila, Kuala Lumpor… He did marketing and sales in APAC for more than 20 years. Then he worked out of Boeing plant in Mesa, Arizona. He returned to Asia working for Bell Helicopter in 1996. In 2001 he came home because he was asked to move to the plant in Texas. Instead he managed Asia plants from SB and travelled a lot. Bill is now retired. His last flight was in 2005 from Santa Monica to SB at sunset. Thanks to those with duties.